Another week is almost over, the weekend upon us which means another plethora of wrestling events here in the British Isles. It's time to get Ready For The Weekend! 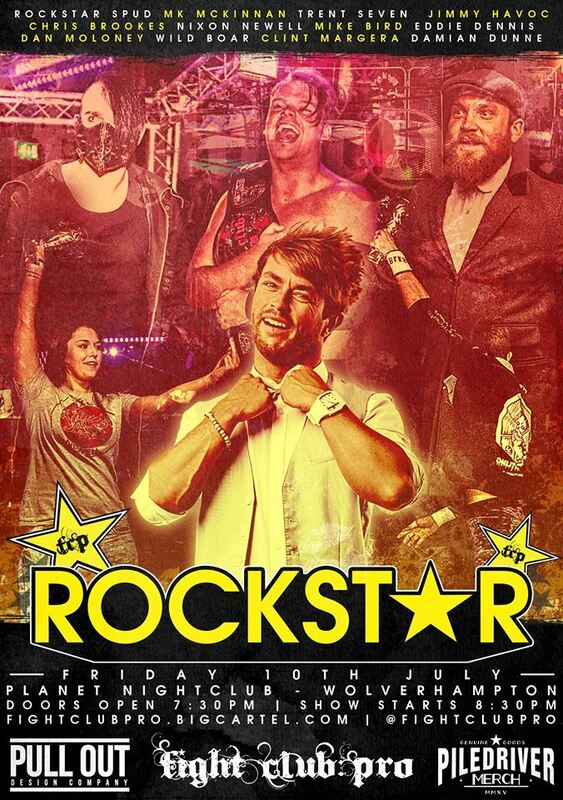 Friday night will see Fight Club: PRO back at The Planet Nightclub in Wolverhampton with their Rockstar show. The event will feature a tag team match between the teams of Eddie Dennis & Mike Bird and Wild Boar & Dan Moloney. Each one of these men are known for their hard-hitting offence so combined together it may be advisable to protect your beer glass from the impeding shockwaves when these two teams go at it on July 10th. From hard-hitting to technical finery, Trent Seven competes against Jack Gallagher in a match that will no doubt be a contender for Match Of The Night when two of the most technically gifted wrestlers in the UK meet in Wolverhampton. And what would an event be without some animosity and there is plenty of it between Chris Brookes & Nixon Newell. The former tag team partners and friends have become the bitterest of enemies in the past few months as Brookes become soley focused on himself and the Infinity Trophy. Will this war end on Friday night when these two compete? Who knows but a battle is 100% guaranteed. 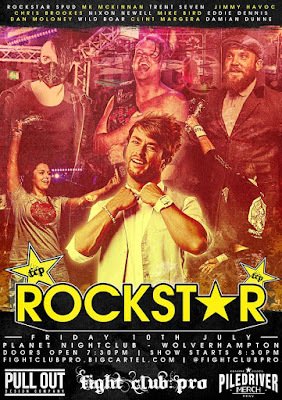 Add in the addition of current TNA star Rockstar Spud making his return to Fight Club: PRO in six man action and a title defense for Champ MK McKinnan and it looks to be another unmissable show. 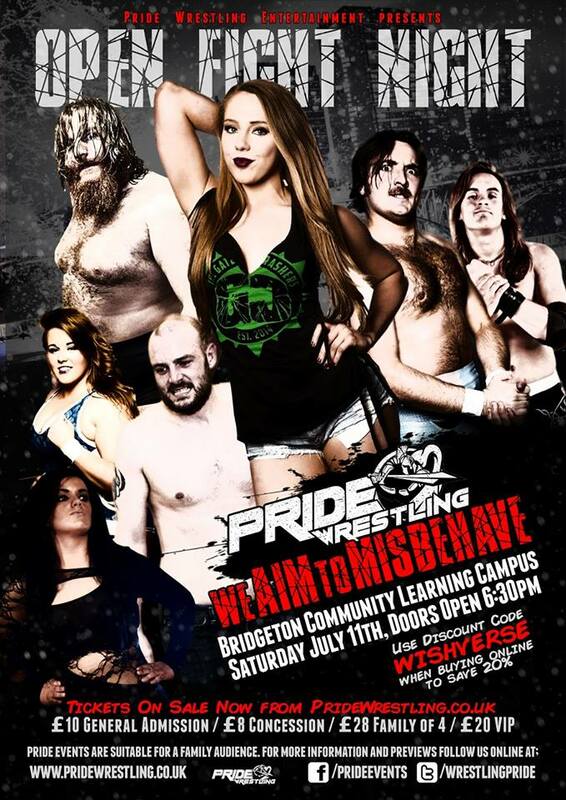 On Saturday night, Pride Wrestling will be back at the Bridgeton Community Centre in Glasgow with their We Aim To Misbehave... Again event. The first WATM show took place last year and featured a night of challenges, where anything could happen. On July 11th, history looks set to repeat itself with another packed show. Firstly we have the always outspoken, Jackie Polo defending the Pride Championship against 'The Beast Of Belfast' Damo O'Connor in the main event. Polo won the championship in dubious circumstances after cashing-in his championship contract on a exhausted Mikey Whiplash, immediately following his win over Glen Dunbar. However on Saturday he'll have his biggest defence yet, literally. 'The Beast Of Belfast' has been on a path of destruction in previous months and Polo could be next on Big Damo's demolition list. From one championship to another as DCT will cash-in his 24/7 contract for an N7 Championship against Chris Renfrew in what shall be Renfrew's first defence since winning the title in May. Also set to take place is Christopher Saynt accepting the challenge laid down by Matt Daly for a match. Daly has made his intentions clear against The Gatecrasher, on Saturday we'll see if he can carry them out. Add in matches featuring the likes of Viper, Mike Musso & Ryan Griffin just to name a few and it looks set to be another historic night in Pride Wrestling's history when wars are ended and new ones begin. 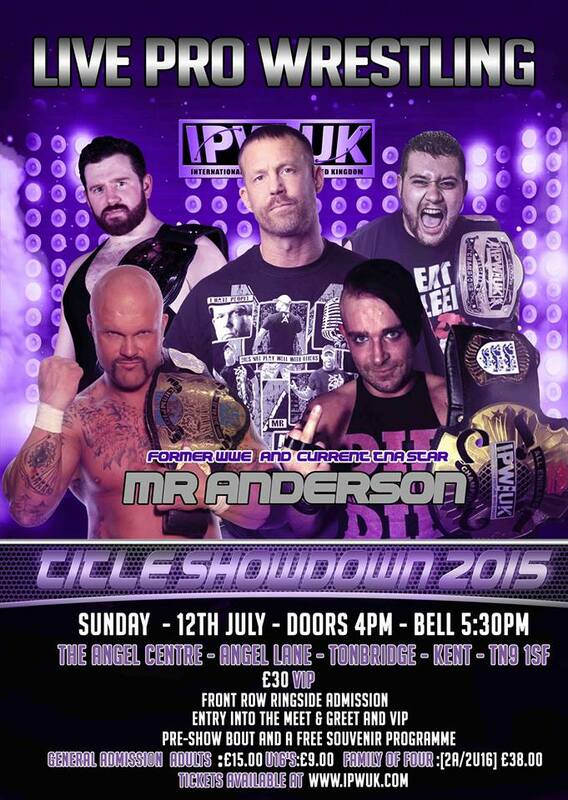 Moving on to Sunday, IPW:UK shall be in attendance at The Angel Centre in Tonbridge, Kent with Title Showdown. 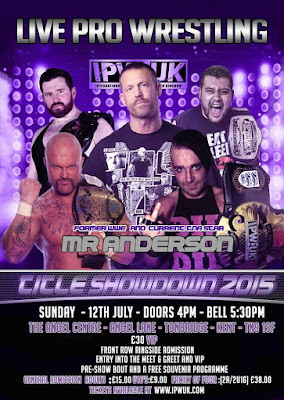 If there is one thing that IPW:UK do and do well, it's put on high quality, consistent events. Sunday looks to be no different with a varied match card on offer. First up we have Danny Duggan & Cieran Donnelly challenging the ever dominant team of The London Riots for the IPW:UK Tag Team Championship. In a match between two legends of British Wrestling, Doug Williams will compete in a match against Johnny Saint. Both men are deserving of the term legend and an opportunity to see either man, let alone both in the same match should not be missed by anyone. From one style to another, Sunday will also see international star, Mr Anderson team with the unusual duo of Jonathan Windsor & The Mexican Eagle to face the trio of Sha Samuels, Sebastian & Tom Irvin in a six-man tag team match. All of this plus a IPW:UK World Championship defence by Bad Bones against a mystery opponent and matches involving Iestyn Rees, Grado, Jonny Storm & Will Ospreay.